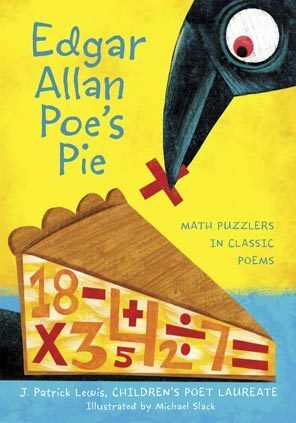 In his book, Edgar Allan Poe’s Pie, J. Patrick Lewis takes readers on an incredible journey by taking fourteen famous poems and turning them into math teasers. Many of the poems contain rhyme, and all of them contain beautifully rendered illustrations by Michael Slack that enhance the reader’s visual experience. Children will discover goofy poems about yaks, eighty-foot long frankfurter buns, and termites (among other oddities) all the while sharpening their math skills. On the final two pages of the book, children get a glimpse into the lives of the fourteen poets whose works were borrowed, as small biographies and caricatures are displayed. Lewis does on outstanding job of incorporating rhyme and rhythm into each of his fourteen parodied poems. Nothing about what Lewis writes seems forced but instead flows very naturally. Some poems, like “William Carlos Williams’s Pizza” contain shorter lines that create a clipped rhythm while poems like “Lewis Carroll’s Fish and Chips” contain longer lines that help to develop a more in depth plot. Reading these poems out loud would be an ideal way for children to hear the rhythm and beat of the poem as well as the rhyming words. Then having children read out loud to each other or in small groups would help to improve individual reading fluency. Although younger audiences would not be able to solve the math problems, listening for rhyme would help to build phonological awareness. The colorful, often bizarre illustrations created by Michael Slack go a long way to help children visualize and interpret what is occurring in each poem. Although the illustrations will not help in the visualization of each math teaser, children can easily avoid frustration by referring to the answer written upside down at the bottom of each page. As pointed out by School Library Journal, some of the illustrations include “A mustachioed cowpoke and his horse, clad in their “tightie whities,” standing before a clothesline hung with colorfully printed boxer shorts; a girl eating a doughnut “flying” above a lengthy train with the help of three birds holding her umbrella aloft with their feet.” All of the illustrations follow the same zany tone set in the poems themselves, creating the perfect combination. Because of the varied difficulty levels of the math problems, this book would be best suited for upper elementary and middle school students. While using this book in a library program, students could get into small groups and take the time to solve the math problems. Coming back together as a group, students could then discuss their answers and the methods they used to arrive at those answers. As an aside, this book would afford elementary and middle school math teachers an excellent opportunity to present a “poem of the week” to their students. Additionally, librarians could locate the original poems parodied in this book and have students compare and contrast elements like language, rhythm, and rhyme, noting the degree to which the parodied version differs from the original. Students could then attempt to create their own parodied version based upon their favorite subject in school. These versions could include riddles or be subject-specific. J. Patrick Lewis’ birthday is May 5th. Taking time to display some of his books or a poster about his life would be an excellent way to honor his work. Edgar Allan Poe’s Pie has been nominated for a Great Lakes’ Great Book Award this year and has received positive reviews from School Library Journal, Booklist, and Publishers Weekly. Books in Print. Texas Woman’s University Library. (Accessed October 3, 2013).